Starting points for getting acquainted with the phenomena of dissipative solitons are chemical reaction diffusion systems and a planar semiconductor-gas-discharge system. These systems exhibit dissipative solitons in the form of self-organized localized concentration spots and current density filaments, respectively. 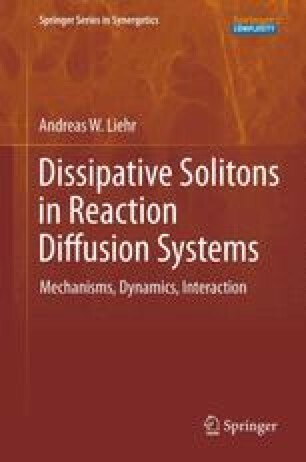 The chapter discusses the experiments and concentrates on the phenomena being directly related to the particle-like characteristics of dissipative solitons in spatially extended systems. These are the dynamics of single dissipative solitons, their mutual interaction by scattering and formation of bound states, as well as generation and annihilation processes. Due to the focus of the book, only continuously driven experiments are considered. An experiment is a device to make Nature speak intelligibly. After that one has only to listen.